Dementia — A Deeper Dive! A few weeks ago, an associate of mine was speaking to me about their parent’s increasingly noticeable memory loss issues. We spoke about possible causes that excluded dementia. I think it’s important not to jump to any conclusions. There are a number of reasons that a senior might experience short-term memory impairment. I also told him to see a gerontology doctor for an assessment. Because I have blogged a good deal about dementia, I also told her that she might reference my blog postings focused on the category of “dementia” and “Alzheimer’s” for further background. Her mom’s diagnosis reminded me that I had not blogged about the various types of dementia that exist. We spend so much time focused on “Alzheimer’s” dementia. In fact, we seem to call all memory related issues in seniors “Alzheimer’s”, just as we used to refer this state very broadly as “senility”. So here is my ‘deeper dive’; a non-clinical overview of the more prominent variations of the diseases generalized by the term “dementia”. Dementia is “a usually progressive condition marked by deteriorated cognitive functioning often with emotional apathy.” The cause of dementia is a brain dysfunctio n which disrupts the thought process and perception. There are actually two types of dementia: reversible and irreversible. Reversible dementia is brought on by a disease or a condition such as an infection, intoxication, depression, a reaction to medication(s), heart or lung problems and other disorders that may deprive the brain of oxygen. This is why I talked with my associate about the causes of dementia. 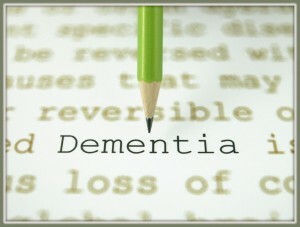 Most of us immediately associate dementia with irreversible dementia. Irreversible dementia is characterized by a pathological disease that is progressive with no other cause identified. With over 5 million people over the age of 65 experiencing Alzheimer dementia, this form of the disease is by far, the version that is diagnosed the most. But, as I stated in the introduction of this blog post, I wanted to introduce the other, somewhat less prevalent forms of dementia. Vascular Dementia — Vascular dementia is a general term describing problems with reasoning, planning, judgment, memory and other thought processes caused by brain damage from impaired blood flow to your brain. You can develop vascular dementia after a stroke blocks an artery in your brain, but strokes don’t always cause vascular dementia. Whether a stroke affects your thinking and reasoning depends on your stroke’s severity and location. Vascular dementia also can result from other conditions that damage blood vessels and reduce circulation, depriving your brain of vital oxygen and nutrients. Factors that increase your risk of heart disease and stroke — including high blood pressure, high cholesterol and smoking — also raise your vascular dementia risk. Controlling these factors can help lower your chances of developing vascular dementia. Frontotemporo Dementia (FTD) — FTD is a neurodegenerative disease characterized by severe frontotemporal lobar degeneration. The disorder was first identified in 1994 by Kirk Wilhelmsen and colleagues, who distinguished it from Alzheimer’s disease and Lewy body dementia based on the fact that it did not manifest with amyloid plaques, neurofibrillary tangles, or Lewy bodies. Second only to Alzheimer’s disease (AD) in prevalence, FTD accounts for 20% of pre-senile dementia cases. Symptoms can begin to appear on average around 45 to 65 years of age, regardless of gender. The most common symptoms include significant changes in social and personal behavior, as well as a general blunting of emotions. Currently, there is no cure to FTD, but there are treatment options available that help alleviate the symptoms. Parkinson’s Disease — Parkinson’s disease is a progressive disorder of the nervous system that affects your movement. It typically starts between the age of fifty and sixty. It develops gradually, sometimes starting with a barely noticeable tremor in just one hand. But while a tremor may be the most well-known sign of Parkinson’s disease, the disorder also commonly causes stiffness or slowing of movement. In the early stages of Parkinson’s disease, your face may show little or no expression or your arms may not swing when you walk. Your speech may become soft or slurred. Parkinson’s disease symptoms worsen as your condition progresses over time. Although Parkinson’s disease can’t be cured, medications may markedly improve your symptoms. In occasional cases, your doctor may suggest surgery to regulate certain regions of your brain and improve your symptoms. So there you have it! Just a bit more information to make you aware of that there are various types of dementia. Alzheimer’s is by far, the most diagnosed form of dementia followed by Frontotemporo Dementia (FTD). I you find this information useful and that it adds to your knowledge base.